Bud Light has released a series of new ads, taking a jab at Miller Lite’s latest commercial and reinforcing its position against corn syrup. 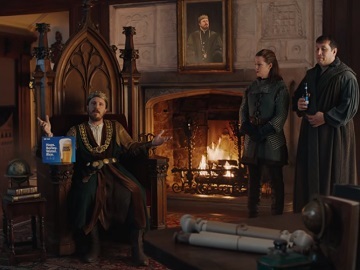 One of the spots, created by agency Wieden+Kennedy, is dubbed “Imitation” and features the King by the fire delivering a message to Miller Lite. “Miller, Miller, Miller, I’ve been made aware of you recent advertisement. I brought you your shipment of corn syrup and this is how you repay me?” he asks, adding “Look, if you’re this set on imitating our kingdom, may I suggest also imitating this by putting an Ingredients label on your packaging?” “People want to know what ingredients are in their beer,” the King also says from his throne. “Or what do I know? I’m just the king of a kingdom that doesn’t brew beer with corn syrup,” he mentions, giving high five to one of the messengers standing nearby. “Bud Light – Brewed with no Corn Syrup,” the voiceover says at the end of the commercial. There are two other spots, titled “Imagine” and “Royal Bath”. The latter features the King taking a bath and telling his servants what he loves about Bud Light. He then starts wandering around the chamber with only the crown on his head, praising the brand’s beer, until someone asks him to put some pants on. The “Imagine” spot, which also highlights that Bud Light has no corn syrup, no preservatives and no artificial flavors, shows a court chemist talking to the King about his latest discovery: a preservative that could be put in Bud Light and make it last thus forever.